This bamboo flooring has the look of hardwood. Not sure what flooring to choose? 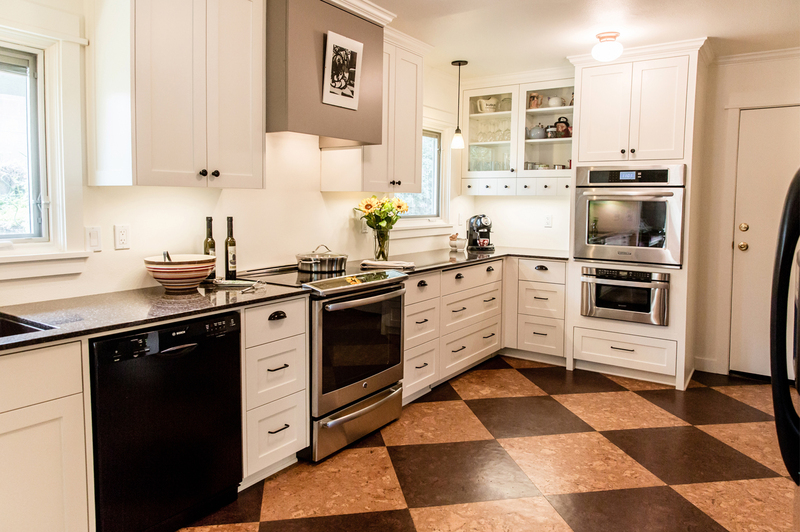 White shaker cabinets are versatile enough for any floor type! When you’re a parent, remodeling your kitchen can be much more difficult. In addition to everything that must be considered when choosing your materials, you now have to consider your child’s safety as well as the possibility of damage to the material itself. This is most true when deciding on what type of floor to use. As much as you may try, it’s difficult keeping a boisterous toddler in one place – eventually they’ll find their way into the kitchen, and they’ll probably want to play on the floor. Any parent can imagine the multitude of possible issues – from wet, slippery flooring to unsafe adhesives to nicks and scratches on the actual floor itself. Choosing the right flooring material from the outset can prevent many of these issues from ever arising. In general, it’s best to avoid flooring that will require any adhesives, but if they do, make sure that non-toxic formaldehyde-free adhesives are used. If the flooring material requires a sealant, make sure that this is also non-toxic. If you’re concerned about the type of flooring your children will be exposed to, the following options can help keep your mind at ease. Love this look? 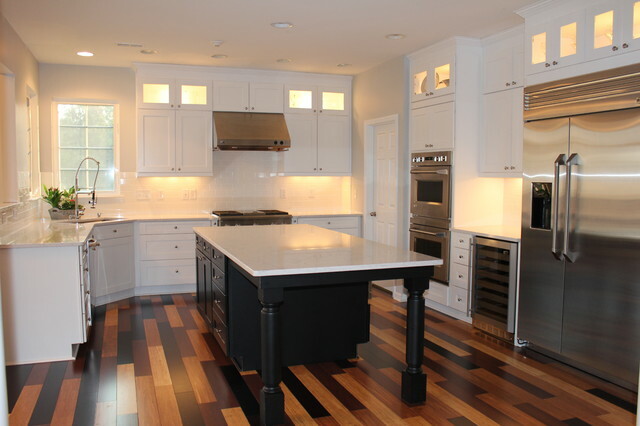 Dark hardwood pairs perfectly with our Signature Brownstone kitchen cabinets! If you’re lucky enough to already have hardwood flooring in your kitchen, your best bet is to simply keep it. Undergoing a massive renovation project on your kitchen floor will not only extend your remodeling time and take a good chunk out of your budget, but it will also mean excess dust and allergens, which may pose a health hazard to your young child. 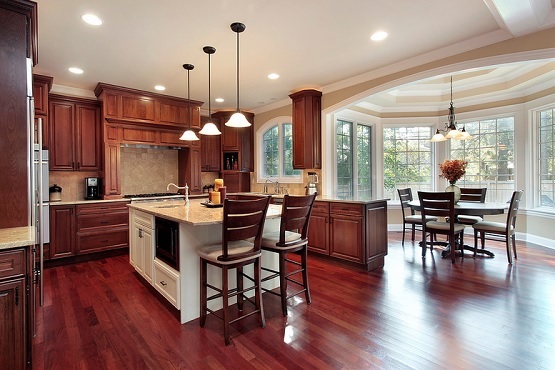 Hardwood is also one of the best flooring options for your kitchen. Maintenance-wise, it’s very easy to clean and it won’t harbor dust, pollen, or other allergens that your child may come into contact with. It also has the durability to withstand possible nicks and scratches, so there’s no need to panic at the sight of your child dragging their toys across the floor. Light-colored hardwood flooring hides little imperfections much easier than dark-colored flooring. Distressed hardwood flooring already has enough imperfections to hide any nicks and scratches that your child may manage to make on the floor. One of the benefits of hardwood, its hardness, might actually make it an undesirable option for some parents. It may better ease your fears to have a softer surface in the case of unexpected trips and falls. If this is something that worries you, then cork flooring may be the better option instead. Cork is also desirable because of its antimicrobial properties. Unlike some other flooring options, cork repels the growth of mold, which may pose a health risk to your child. Cork is also a great option if aesthetics are a concern to you. Once sealed, it’s very difficult to stain, which is an important feature for a kitchen floor. It also has the look of hardwood and can pair very easily with most kitchen styles. The only downside of cork is that its softness also leaves it vulnerable to scratching and damage. However, this isn’t necessarily a reason to decide against it. 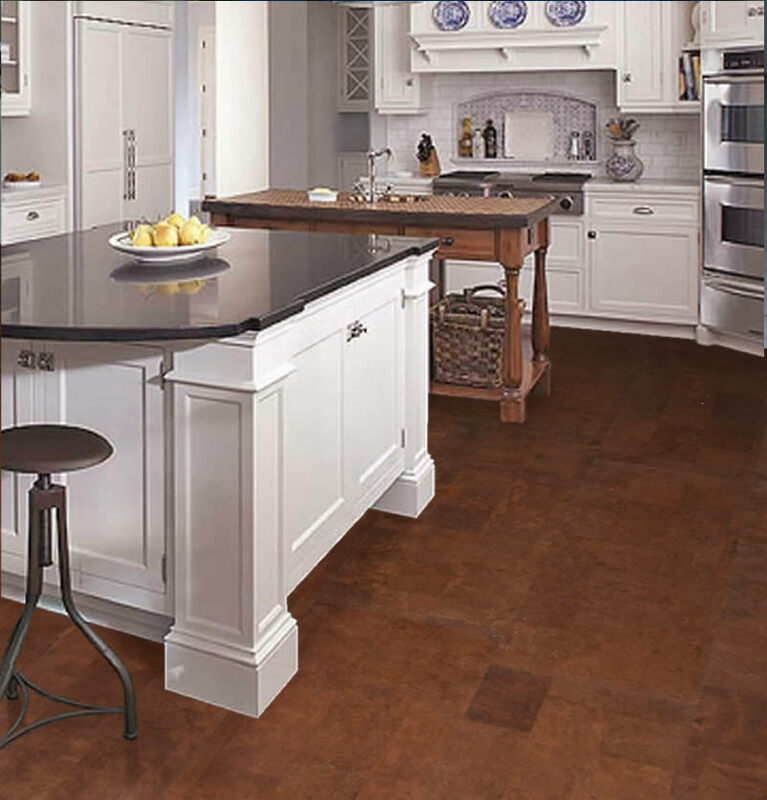 After all, cork flooring is usually installed as tiles, meaning that any damaged tile can be easily replaced. One flooring option that’s been gaining in popularity in the last few years is bamboo. Though it possesses the look of hardwood, it’s technically not a wood at all, it’s a grass that is pressed together and combined with adhesives to create a durable surface. In addition to being environmentally-friendly, bamboo flooring also stain-resistant, which is desirable in the kitchen where spills happen regularly. Bamboo comes in a variety of grades, with some being stronger and more durable than others. When choosing your bamboo flooring, be sure to seek out a reputable manufacturer that uses non-toxic adhesives and sealers. Of course, in addition to safety and durability, the price of your floor may also be of concern. If you don’t already have hardwood flooring, installing it may be quite costly. However, there are now numerous engineered options that provide an alternative to hardwood without the hefty price tag. Laminate has gotten somewhat of a reputation as being cheap-looking, but advances in technology have produced laminate flooring options that are quite attractive to look at. Some are often indistinguishable from hardwood. Just like hardwood, laminate is also easy to clean. As with any other floor, cleaning up any spills as quickly as possible will prevent any issues. Laminate is also a great option if you’re concerned with allergens. Dust, pollen, and other allergens won’t penetrate the tight seal of your laminate flooring. Laminate’s one downside is that it can be slippery when wet. To prevent any nasty falls, seek out textured laminate, as the raised surface makes it harder to slip on. Floating floors, which are floors that are simply placed on top of the surface without any adhesives, are a great way to cut down on any unhealthy volatile compounds. They’re also easy to install, so you can cut down on labor costs by making your flooring installation into a DIY project. If you’d rather not use floating floors, remember to seek out adhesives and sealants that are free of formaldehyde and other toxins that may pose a health hazard to your child. With the flooring options above, the styling and design options are limitless, so there’s no compromising on aesthetics. More importantly, you’ll get the peace of mind of knowing that your child is safe in your home.